(French) Isabelle Thomas is a personal stylist and personal shopper. She helps people who want to present a good image of themselves to cultivate a personal style, to learn how to show themselves off, and to take the best of trends: far from the diktats linked to age, body type and disposable fashion. She re-examines wardrobes, she accessorizes outfits, she creates new silhouettes during sessions of wardrobe detox, and she organizes personal shopping sessions in various Parisian neighborhoods. In the same vein, three years ago she created her blog – Mode Personnel(le) – a guide of fashion advice and inspiration that is among the influential blogs in the French blogosphere. She is also the co-author of You’re So French, Cultivez votre style (La Martinière – September 2012, translated into 7 languages), a practical guide to fashion in the spirit of the times and describing the “French touch,” a singular manner of living fashion, at once elegant and spontaneous. The book lays out a portrait of elegance “à la française” and responds to questions from women eager for advice on how to follow trends without looking like everyone else, how to play with fashion and indulge themselves. A volume dedicated to men – You’re So French Men, Secrets d‘élégance masculine (La Martinière) – was released May 2, 2013 in France. 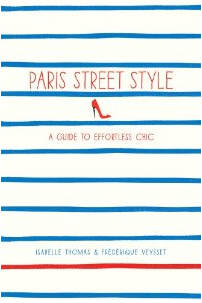 Paris Street Style: A Guide to Effortless Chic by Isabelle Thomas and Frédérique Veysset. She also occasionally writes for the press: she has been a journalist for women’s magazines for around fifteen years (notably, as an editor in chief). ” One city always seems to win the award for most-wanted style—Paris, where people walking down the avenues mix timeless and trendy pieces in a way that appears effortless. French fashion writers Isabelle Thomas and Frédérique Veysset break down the “je ne sais quoi” of Paris street style, describing the essential elements that should be in everyone’s wardrobe. Renowned experts on French style—designers, stylists, editors, and celebrities—also chime in to reveal their favorite accessories and how to create multidimensional looks and make affordable clothing appear luxurious. Starring both fashion icons and anonymous women met on the streets of Paris and richly illustrated with hand-drawn sketches and Veysset’s striking photographs, Paris Street Style is an inspirational fashion guide that will allow you, no matter where you are from, to cultivate an everyday style of timeless glamour, careless, easy chic.” —votre style français. AWP: What was your first exposure to fashion? How did your interest in fashion unfold? IT: My mother was a dressmaker. She made theater costumes and clothes for the girls in the family. In adolescence, I wanted to draw my designs and I was searching for my style: different from the jeans t-shirt sneaker combination others were wearing. I remember a pair of flowered pants made from furniture fabric; they were sublime. Today, I don’t know if I would be capable of imagining a collection, but I still love dressing myself and letting myself be surprised by fashion. Women, mostly, work passionately without worrying about what is “in” or “out.” Even if I am wary of the current trend, which quickly bores people, it’s a true pleasure to discover the work of creators that I admire. I love searching for a gem: a dress with particular details, a rare print…falling madly in love countless times, which leads my wardrobe to expand. For me, clothing is not superficial, it expresses the person you are. It reveals our personality and state of mind and says what we want to show or not. Today, everything is allowed. Social convention no longer obliges us to respect a clothing code, the constraints have disappeared and fashion is available to everyone. Even if the big labels dress us all the same from one end of the planet to the other, everyone is free – or not – to stand out. But this freedom can be troubling: the rules being shattered, some people feel lost before their wardrobe. AWP: What inspired you to a life and career in this industry? What influenced this vision? IT: Even before working in fashion or imagining that I could be part of this world, I was passionate about clothes. My wardrobe has always been full. Now, I also take care of other people’s wardrobes. I am proud to have given the desire to dress up to people at odds with their image or women who buy a lot without understanding how to use it. I love helping visitors discover the boutiques of Paris. I come alive to their curiosities and desires! AWP: Did you feel a need to share a particular time and place for women in the style of today? IT: My blog Mode Personnel(le) is a place for sharing and lightheartedness: a liberating space where I share my advice so that everyone can claim their clothes and explore their own creativity. I try to make people want to be daring and to look like no one but themselves. Whether you’re classic, ultra feminine or whimsical. For me, there is no age limit or ideal figure needed to dress up. You can always find your style and let it evolve, with more or less daring depending on the moment or your desires. I don’t give lessons. I shun the rules and perceived ideas that enclose women like a stranglehold. Many readers write me to say they’ve changed their wardrobe and their look thanks to the blog. It’s very touching and motivating. AWP: What is it about graceful, stylish and timeless design that is specifically appealing to women at this time? IT: There is no ideal outfit that suits all women on all occasions. We often speak of the little black dress as “the” perfect outfit. That’s just not true. Some women hate themselves in dresses and black is far from suited to everyone! All the better: it is up to each woman to find her best friends, for a while or for life! Nevertheless, I think it is important to invest in quality and to not neglect the accessories. AWP: What do you think is a woman’s greatest asset? What is the second? IT: Having many lives at the same time…even if it’s exhausting. It’s a cliché but I think women are more independent than men. Of course, we complete each other, but I believe in feminine solidarity. And then there’s lightheartedness…even if we take a whole lifetime to get to it. AWP: What is the most valuable thing she has to work with? IT: A fighting spirit. I find my friends are strong, honest and determined. AWP: How do you define style? How do you express your own style? I often wear a print and a vibrant color. Or black with a detail that stands out like a large necklace or jeweled shoes. AWP: Why do women love fashion so strongly? IT: Dressing up goes hand in hand with the attention you give yourself. When you feel good about yourself, it’s a terrific space of lightness and liberty, a time to treat yourself to make yourself happy and take care of yourself. AWP: What modern trend do you love most? IT: There isn’t one, but many. It’s mixtures that interest me. For me: a striped jacket with leopard-print footwear. AWP: Several of our contributors would love to work in the fashion industry. Many of our followers are preparing for a career in fashion. What would you say to them? IT: To tell themselves that anything is possible. AWP: Napoléon Bonaparte (1769-1821), Emperor of the French and was a reactionary pragmatist regarding women, said in a letter written in 1795: A woman, in order to know what is due her and what her power is, must live in Paris for six months. In what way does Napoléon’s statement hold true with your experiences? How is Napoléon’s statement understood by women of today? IT: I must have listened to it without knowing because I left my province at 22 years old to go to Paris and never returned. Fortunately, even though many things happen in Paris, notably fashion, you can be fulfilled and happy without passing through the capital, which is a marvelous city but takes a lot of energy. AWP: Name the single book or movie, work of art or music, fashion or cuisine that has inspired you. IT: Some novelists: all the books of Jane Austen, Wilkie Collins, Jim Harrison, Richard Brautigan, William Boyd, Zadie Smith, Jonathan Coe, Tom Wolfe, and Carl Hiaasen. A work of art: Le Scribe accroupi, an Egyptian statue at the Louvre. Songs: Earth, Wind and Fire; Prince; Jamie Cullum; Jamiroquai to put me in a good mood while passing through Phoenix for the French Touch! AWP: What is the latest book you read? IT: Marie-Blanche by Jim Fergus, a sage full of heartbreak and rage, inspired by the author’s family. AWP: If you were at a dinner party, what question would you be asked? IT: A little more curried chicken, Isabelle? AWP: Tell us something we don’t know about Paris, about France – its style, food or culture. IT: Combining passion and frivolity! Text copyright ©2013 Isabelle Thomas. All rights reserved. French fashion is most popular all around the world. I would like to say thanks to Isabelle to create this great post. Leave a reply on "French Impressions: Isabelle Thomas and spirit of French fashion and personal style"